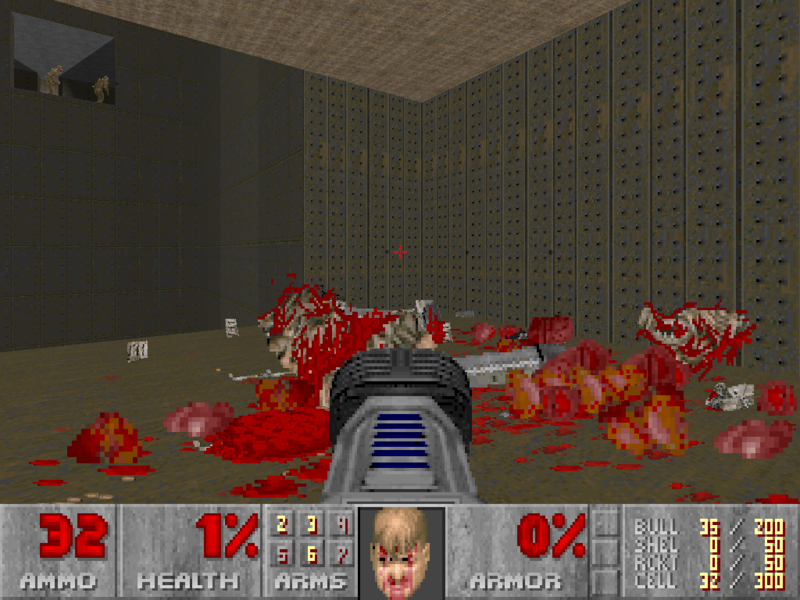 Nice editor for registered Doom .WAD file – even works with v1.2. Allows editing of all items, monsters, walls, etc. Welcome to Doom Thing Edit(DTEdit) Version 2.0 Major Upgrade!! LAZY TO UPDATE ALL THE HELP INFORMATION IN THIS TEXT FILE!!! 1. move them around; place the boss guy right in front of the entrance! 2. change items; change that BFG 9000 into a big brain. 3. Insert and Delete items; Put as many things as you want on a level! 4. change angle; make those rifle guys ambush! 5. save it all to your .wad file WITHOUT rewriting the WHOLE thing! 9. New Configuration File! Set colors, default items, etc. 11. Change skill!! Change the skill level that an item appears on. a touch of a key, pick 1 of 10 default items! 13. Replicate Feature - Replicate your last created item! 14. Import save files created by Deuedit 2.0! 15. View the graphics as you select them! 16. Fix for save to .wad bug! 17. Tremendously faster screen writes! You have to see it to believe it. 18. Fix for Delete bug! 20. Improved and more flexible DTEDIT.CFG file! configurable from the DTEDIT.CFG file! 23. ** Change the brightness of SECTORS! 25. ** Change the Altitude of the floor and ceiling! can be viewed upon loading the .DTE file! ** New for Version 2.00!! 4. A new GUI interface COMING SOON!! Where filename is the name of the doom .wad file you wish to edit. **Once you're in the mapeditor, press '?' for a list of available commands. Menus available for almost EVERYTHING so press '?' if you need help. use the -b switch(explained below) to make backups of the different episodes. -b Create a backup .dte for each and all episodes. Totally experimental. Doesn't really work yet. key while in the editor. item is displayed on the status bar. Move over an item and press 'a'. Change the angle of an object. what level this item will appear on. commands. Default item is defined in config file. permenantly erased. No warning.. No nothing. Be careful! a ratio of .5 for ammo usually does the trick. a new position. Everything stays as before, except for the position. with friends. When saving, be sure to exclude the .dte ending. loaded to the right level. put down for DEUEDIT. I cherish DEUEDIT's fast screen updating! Last thing.. Registration.. This program is NOT free but NOT shareware. All right.. I think that's it! CYA next version! some instructions within it as well. The '#' sign is used for commenting. Place it in front of EVERY LINE that you want to be seen as a comment. Special Special Special Thanks to RoggerF for supplying the DOOM specs! DEUEDIT(TM) was created by Brendon W.
in the same directory as DTEDIT.EXE or the ITEMS.LST is currupt. work, EMAIL me and tell me the situation. 2. I can't quit the program!! restore a backup episode if you used the -b option to create them. wrong. If you can't figure it out, email it to me. computer, but it shows how sloppy of a programmer I am. For some reason, it just does. I'm working on it.